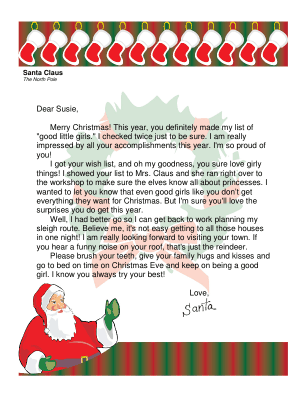 This printable letter from Santa is especially for a little girl and mentions the girly things on her wish list. Merry Christmas! This year, you definitely made my list of "good little girls." I checked twice just to be sure. I am really impressed by all your accomplishments this year. I'm so proud of you! I got your wish list, and oh my goodness, you sure love girly things! I showed your list to Mrs. Claus and she ran right over to the workshop to make sure the elves know all about princesses. I wanted to let you know that even good girls like you don't get everything they want for Christmas. But I'm sure you'll love the surprises you do get this year. Well, I had better go so I can get back to work planning my sleigh route. Believe me, it's not easy getting to all those houses in one night! I am really looking forward to visiting your town. If you hear a funny noise on your roof, that's just the reindeer. Please brush your teeth, give your family hugs and kisses and go to bed on time on Christmas Eve and keep on being a good girl. I know you always try your best!